Published on May 10, 2011 in Uncategorized. 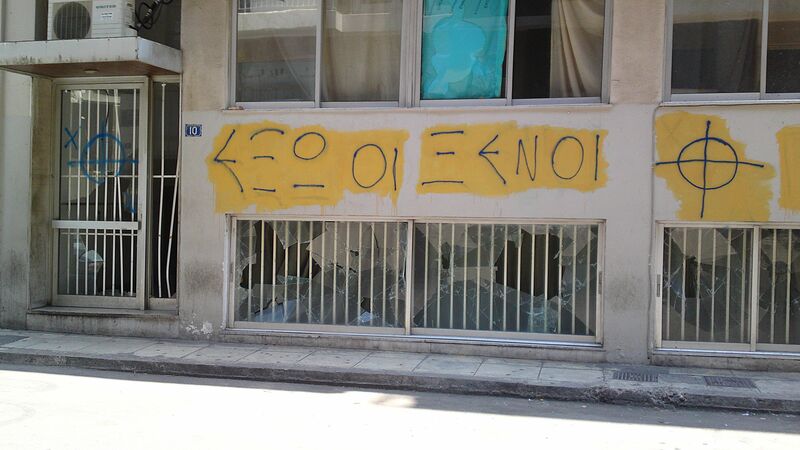 Closed Tags: antifascism / antiracism, athens, greece, repression. 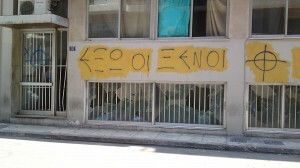 POGROM IN THE CENTRE OF ATHENS SINCE THE 10TH OF MAY!!!!!! My mummy, my small brother and me were going home this afternoon. We had to cross Omonia square. I am very afraid. 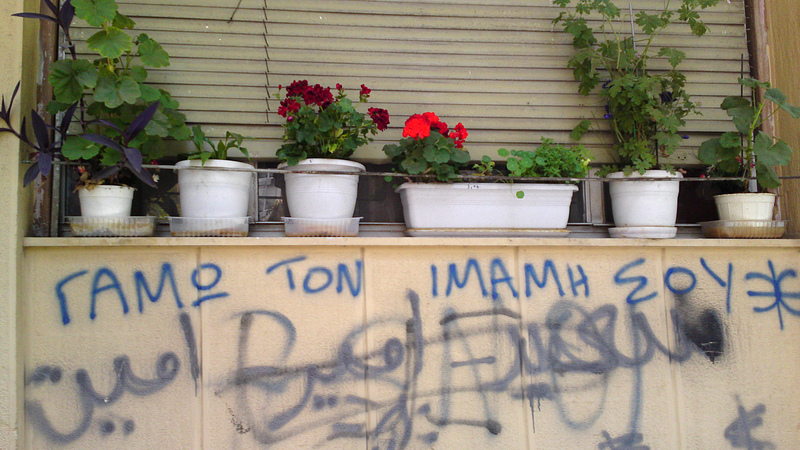 We had to run a lot because we were chased in Omonia. All my friends were chased and beaten – also their mums and dads. One of my friends was brought to hospital. Why was this happening? I am in my room now, but I am very afraid! My legs hurt me so much. I had to run a lot these days! Two times I was running. Hassan is since 6 months in Greece. The rest of his family is in Germany. Only a few months ago his mummy was beaten up by a Greek old men in Victoria square. They spend all the time in their room, because they are afraid to go out. They cannot sleep because of fear. They cannot eat. They are watching the door and listening to the sounds coming from outside in case the fascists cone back. Yesterday some Greeks came to Victoria square. They beat all people there. They also beat me on my head! 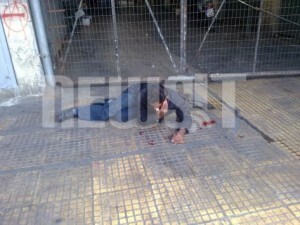 In the early morning hours of the 10th May a theft ended up in the tragic murder of a come-to-be father in the centre of Athens. During the following hours of the day, the media started reporting about “three dark skinned suspects”, hence, initiating a propaganda which ended up in a manhunt by fascists of the extreme right group “golden dawn” on all migrants in the centre of the city. Around 16 o’clock 100 “inhabitants of the neighbourhood”, as the media said, protested against the violent death of the “Greek citizen”. Only some hours later central streets were closed by the police, the neighbourhood was patrolled by armed officers, while a group of 100 fascists attacked migrants and refugees at a central square, beating up many of them. A young men from Bangladesh was so violently stabbed 10 times that he died on the way to the hospital. The fascists split into smaller groups and while some of them threw stones on squatted houses of the areas, others invaded private households of migrants leaving behind them destruction and blood. The public discourse is reigned again by the construction of fear and racist propaganda. During the whole night inhabitants of different neighbourhoods of Athens reported single attacks of fascists on bypassing migrants. At the 11th of May Neonazis threw a molotov cocktail into the house of a Pakistani national in the region of Reddi. In two cases labourers interfered and protected their migrant colleagues from the violent outbursts of fascists. The attacks continued also Wednesday 11th and at the 12th with further “demonstrations” – meaning a huge and enduring POGROM against migrants. Fascist groups attacked Wednesday and Thursday again the two anarchist squats of the area, this time together with the police, and after splitting into smaller groups of up to 10 chased immigrants in the further area….. They beat my friend 10 days ago. They broke his nose. We went to the police station to report the violent attack. The officer just told us to leave. We cannot do anything. A friend of mine was just getting of the bus here in Omonia. Suddenly somebody just hit him on his head with his fist. He didn’t even see it coming. Yesterday there were a young Greek women with a young men. They passed by me at the street. Suddenly the women beat me with a big wooden stick on my head. But you know, they beat everybody and not only now. Since long time. 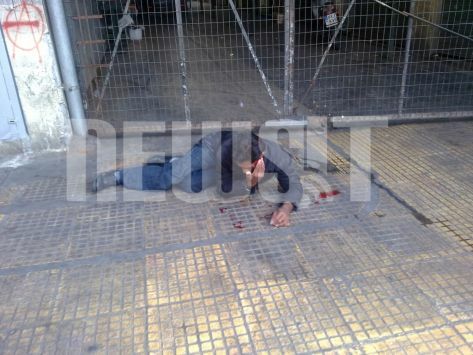 In Attiki they beat people every day! At the 12th and during the beginning of the demonstration against the murderous police brutality of the 11th against demonstrators of the general strike in another part of the cities’ centre around 500-1.000 fascists demonstrated towards Omonia square and invaded a soup kitchen of the municipality of Athens, where poor people – mostly migrants – try survive from hunger, beating up blindly refugees and migrants and stabbing them with knives and hitting them with bottles!!!!! After returning back to the area of Victoria Square and St. Panteleimon / Attiki they attacked again the anarchist squats while continuing their POGROM against migrants in the whole area in the most violent way. Rumours talked about more migrant deaths. The hospitals talked about at least 25 migrants with severe injuries 12 of which were stabbed with knives one was shot!!! The real number of victims is much higher though, since many avoided going to the public hospitals and instead went to the polyclinic of the Doctors of the World or even just stayed home out of fear. The area around Omonia, St. Panteleimon, Victoria Square and Attiki has become a field of war with extreme right wing groups walking around with Greek flags shouting fascist slogans against migrants. Consciously and on purpose the cold-blooded Neonazis kill and destroy in the whole neighbourhood without being severely disturbed by the high numbers of police officers in the area. Migrants report of repeated violent and cruel attacks: beating with clubs on the head, stabbing with knives. A number of at least 30 migrant shops were destroyed also and fascist were chasing and beating even small children of 6-10 years, beating also them on all parts of their bodies!!!!! Attiki Square and St. Panteleimon Square that had been in the past central places of agglomeration were already occupied by fascist groups and marked with graffities of Greek flags. Now Victoria Square also seems like a deserted empty hole. The migrants who know have disappeared and hide inside their homes. Fear is ruling the area that is covered by silence. It is since a month and not only these days of the extreme pogrom that a lot of migrants come to our polyclinic with injuries of fascists attacks – most of the have been hit while walking on the street on the head or at their back. … We have been witnessing the whole period an increase of fascist violence with an extreme rise in the last week and since the death of a Greek last Tuesday. We had been warning before, that the death of a Greek (the murder of a migrant unfortunately is not paid attention to) might get the initiator of more violence. We had every day 2-3 persons in the hospital. At that time most attacks occurred arounf Attiki Square and St. Pantleleimon Church. The violence became less when we left the area. We went to Victoria Square, but since Tuesday this square has also been closed by the “golden dawn”. The murder of the 44 old Greek in the early morning hours of the 10th is being misused as the symbol for the new crusade of the Neonazis in the area. Instead of mourning the loss with respect, the ‘grieving’ fascists are violating and exploiting the tragic death for their own purposes. Though the media report also about the pogrom and the extreme right wing violence in the area, they highlight the death of the Greek citizen and the ‘increased criminality and violence’ in the cities centre and the ‘ghettoisation’ due to immigrants – but the victims of the Neonazis were referred to until the 13th only in one sentence as collateral damage. Only since the further brutalisation and intensification of the pogrom at the 12th newspapers are titling also about the right wing violence. 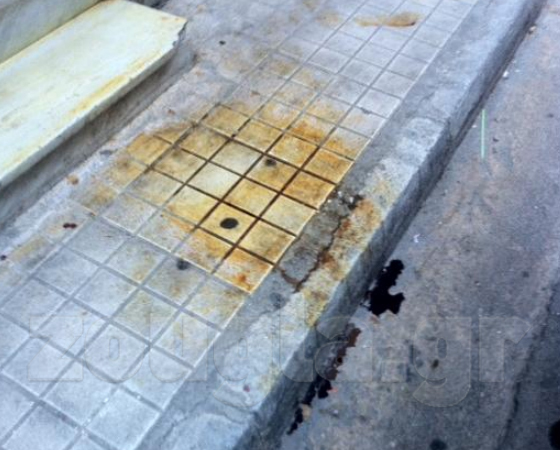 The municipality of Athens plans to encounter ‘the problem’ by police raids against ‘illegal’ migrants, shops, street vending and brothels while increasing their repressive measures, they plan to ‘clean’ the area. The centre of Athens is an area to be gentrified and ‘up-graded’, thus, the pogrom of the Neonazis is adding its part on the dirty ‘job to be done’ – no matter what the consequences. 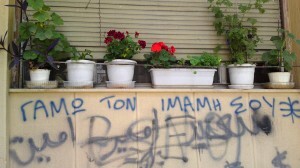 see also (in Greek): http://www.zougla.gr/page.ashx?